Line a 9X13-inch baking pan with foil and lightly spray with cooking spray. In a small bowl, mix together the graham cracker crumbs and butter until evenly moistened. Press into the bottom of the prepared pan. 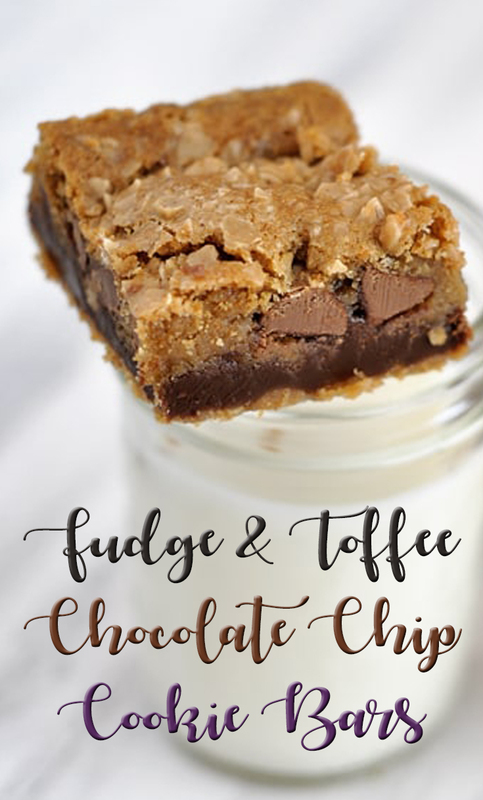 For the fudge, in a microwaveable bowl, mix the sweetened condensed milk, chocolate chips and butter. Microwave for one minute at 50% power. Stir. Microwave for another minute and continue stirring and microwaving until the mixture is smooth and melted. Pour the fudge mixture over the crust, spreading evenly. Sprinkle with the toffee bits (1/2 cup). For the cookie layer, in large mixing bowl with an electric mixer (handheld or stand mixer), beat together the butter, milk, vanilla, and brown sugar. Add the egg and mix. Stir in the flour, salt and baking soda. Stir in the chocolate chips. Dollop this mixture by tabespoonfuls across the fudge layer and spread to form an even layer. Sprinkle with the toffee bits (1/2 cup). Bake for 30-35 minutes until edges are puffed and the top is golden brown. Don't overbake or the bars will be tough and dry. Pull them out when the top is golden but the cookie dough still looks a bit soft. Cool completely and cut into squares.